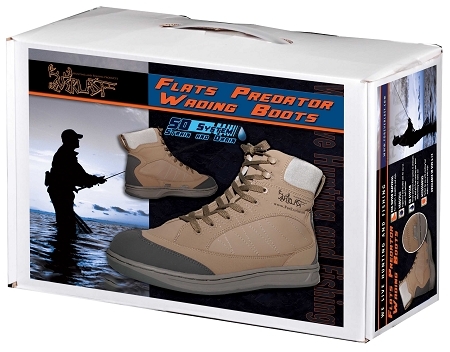 New and improved for 2019 our Flats Predator Wading boots provide a comfort fit while bare foot wading or with stocking foot waders. Now with 6 ports the Strain and drain system will not allow rocks and debris to enter and lets water out keeping them lightweight and the EVA material provides comfort fit while hard sole provides traction and stability over structure. Great boot great value! I have always had a problem finding wading boots cause I am allergic to neoprem. I saw the new predaor boot at the fishing show in Houston and had to try them. They are great easy off and on and very comfortable and the price is even better. My search for wading boots is over now.